So you play a mean guitar and want to record your music but you don’t have a big budget to sink into a full home recording studio. Don’t fret (pun intended, sorry I couldn’t help it.) because you can turn your iPad into an all-in-one recording studio. That’s right. You can now let out your inner rock star on the go and not miss the moment your muse tickles your brain with new music ideas. For years people have been using garageband to record from their apple desktop computers, but who would have thought that you could bring your music studio with you and record “in the moment”. Here are a few options that really make it easy. The StudioConnect by Griffin is an innovative simple docking studio for your iPad. You can plug your guitar in, or a MIDI device. It also has a separate jack for your headphones. This is quite possibly the best thing to happen to home recording enthusiasts. It’s not designed for pros but it will do the job for most people just trying to lay down some great tracks from the comfort of your own home. For those of you who consider yourselves a pro, you might want a few more jacks. 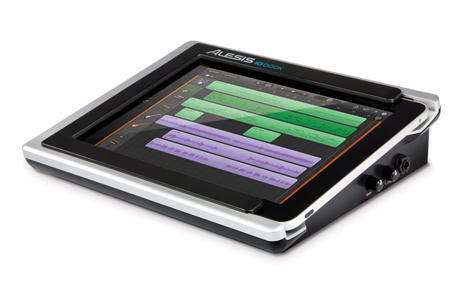 The IOdock from Alesis has quite a few more options. It is a bit more pricey. (About $50 more) but you can connect more instruments at the same time and record all at once. It has a 25 degree angle to so you can easily stand and play while watching it at the same time. It will easily allow you to get professional sound in an on the go package. Now that you are recording with your iPad, you don’t want to use just any headphones to go along with it. Instead you should make sure you are hearing all of the nuances in your music. For this I would actually recommend ZAGG’s Bluetooth Headphones found here. Now that you have the freedom to record anywhere you want, don’t make the mistake of tying yourself down with cables. Instead, choose some bluetooth headphones that give you the sound you are craving and set you up to really have a fantastic recording experience anywhere you want to be. One of the big complaints about the iPad is that it’s a device mainly used for consumption. That may very well be the case, but products and add on’s like these open up a whole new world to those who want to create. So let the creativity begin! Don’t just check your email or facebook or play games, use this amazing device to give the world the music that is inside you. Who know’s you might just make it big. You might create something that will live on forever, or you might just have the fun you’ve always been craving. Whatever you do, get started right now and enjoy all of the possibilities. Ben Tanner is a technology writer for ZAGG. He loves to work on, use and write about gadgets. He also loves to play his guitar and spend time with his family.